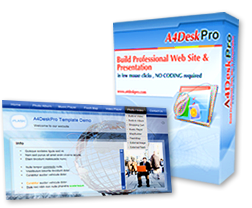 " If you would like to try your hand at creating impressive websites, give this program a try. I think you'll like it. Cool ... "
" A powerful flash website creator. Make my own webpage and presentation in minutes. The possibility is unlimited ... "
" Whether you're building webpage for the first time or you're a more experienced developer looking for a way to save time, this program won't let you down." All-in-one software for creating responsive website in HTML5, no coding is required. It can be used to build responsive website that can be viewable in almost all desktop browsers, mobile and tablet devices. Coming Soon! We offer wide selection of template categories and themes to match your needs. View and edit template from your local desktop, make & publish web site on any hosting. What is the difference between A4Desk and A4DeskPro? Add your own text, images and background music to the web page template. You can modify color theme to suit your style. Publish to your own folder on desktop with html, image and xml files, then upload all files to your web server easily. Most popular search engines, including Google, already support indexing of Flash content. A4Desk also comes with a built-in form for you to easily define page title and add meta tags . This allows you to optimize your web page for search engine indexing. iMapBuilder mapping software help creating interactive maps for analyzing and presenting geographical information without any coding knowledge. HTML5 Map Software can create HTML5 maps that supports cross-platforms (e.g. PC, Mac, iPad, tablets, iPhone, Android and other mobile devices). iMapBuilder Online Google Map Maker, a cloud-based software without installation required, can create Google Maps or Image Maps, and directly share or embed the maps online. With iiCreator, you can pinpoint, draw and annotate on image files. Mapping Software that creates interactive maps. No Coding, no Learning required. Easy world map maker. Share video on the internet with this flash streaming video player. Organize photos with categories using this album tool. Add an interactive MP3 player to your website/CDROM in minutes! No coding.